The monarch of Okemesi Ekiti, Oba Micheal Adedeji has honoured the Head of Civil Service of the Federation, Mrs Winifred Oyo-Ita, with the chieftaincy title of Mayegun of the town. The monarch announced the honour when Oyo-Ita visited the palace on Thursday. Newsmen report that Oba Adedeji commended her hard work and diligence. He said he was delighted to receive her in his palace at Okemesi Ekiti. ” I wish to state categorically that the Buhari led-administration was the most powerful one, that we have ever had in Nigeria. ” And with the support that Mrs Oyo-Ita has given to my son, Ayodele Folayan, I am giving her the chieftaincy title of Mayegun of Okemesi as a sign of gratitude to her. ” I also believe that ‎she will continue to support our town and our son to climb the ladder of success during her tenure,” he said. 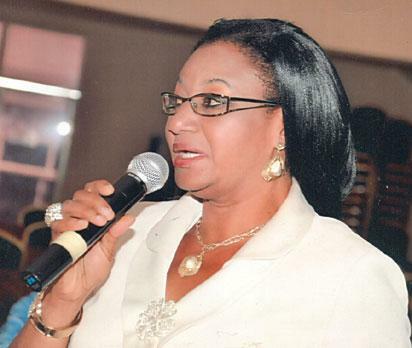 Mrs Winifred Oyo-Ita, said she was highly delighted about the honour, even though it came to her as a surprise. ” I want to assure his Royal Highness that he will never regret giving me a chieftaincy title and also I promise to take the title to my people in order to inform them to start preparing for my installation,” she said. The post Oyo-Ita, becomes Mayegun of Okemesi appeared first on Vanguard News.